Central Montcalm High School is located in Stanton, MI and is one of 2 high schools in Central Montcalm School District. It is a public school that serves students in grades 9-12. 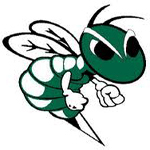 Libby Ledford and Hannah Putnam shared scoring honors for the Hornets with 15 points apiece en route to the 49-24 win. Alyssa and Hailey Leister led the Panthers. In the 55-16 win, Hannah Putnam scored 15 points and Bailey Vissman added 14 for the unbeaten Black Knights. Katie Crawford led the Bluejays with 11 points.